I first tried mango bread at a picnic, and while I don’t remember anything else about the event, I do remember this bread. It was brown, tasted like spice cake, had a nice shape and little orange flecks throughout. At the time, I wasn’t crazy about mangoes, but this recipe won me over. After requesting the recipe, I was told it was from Saveur. I looked it up and made a mental note to try it, but waited about four years to do so. Mangoes were on sale everywhere this week, and I finally remembered to try this recipe. A key feature is that it calls for 1/2 cup of mango puree, and while I wasn’t really happy about having to clean my processor just to puree 1/2 cup of mango, I did it anyway. Next time I might try using a half cup of pureed mango baby food or something similar. Other than having to puree a mango (and clean up after), this recipe is about as simple as it gets. I think a bit of ginger along with some candied ginger or maybe some golden raisins might make a nice addition for next time. 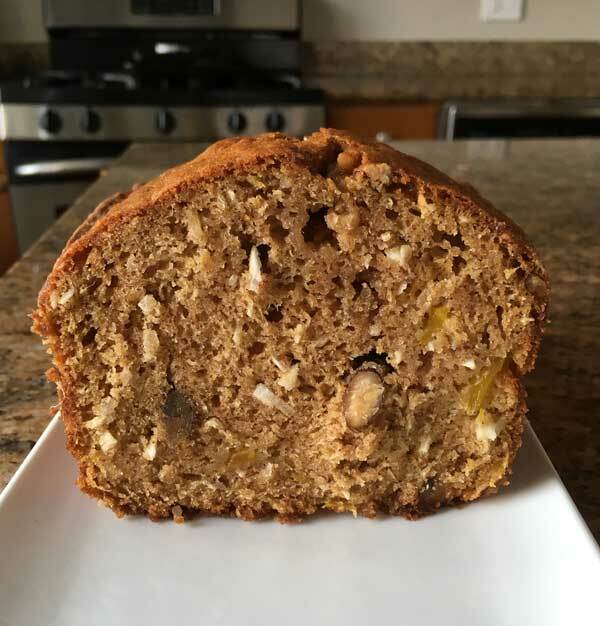 Mango Bread made with mango puree, 1/2 cup coconut and 1/2 cup nuts. Preheat oven to 350°. Grease an 8 ½ by 4 ½ inch loaf pan and line with a strip of parchment and dust with flour. Peel and chop the mangoes into small pieces. Puree enough mango to make ½ cup, then set the rest of the chopped pieces aside. In a large mixing bowl, whisk together the flour, sugar, baking soda, salt, cinnamon and nutmeg. Make a well in the center of the dry ingredients and add oil, eggs, yolk, mango purée, and vanilla. Stir well, then fold in mango, nuts, and coconut. Pour batter into prepared pan and bake for an hour or until a skewer comes out clean. Yum! 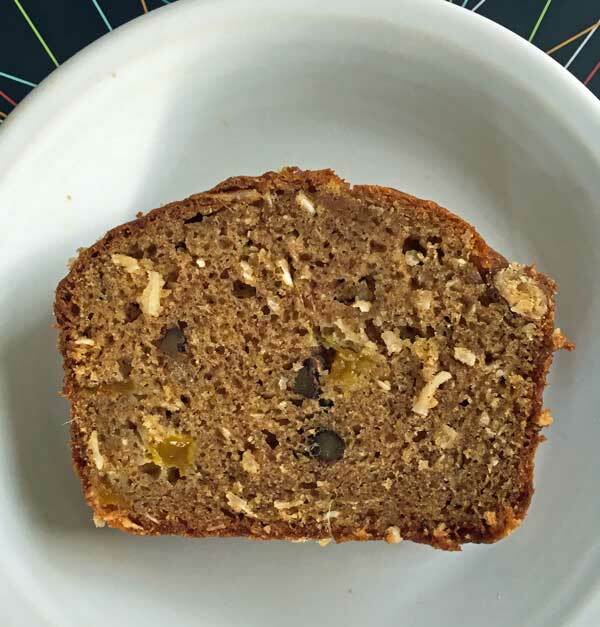 I love mangoes and have never had a mango quick bread… This sounds amazing! Sounds good. Instead of pulling out the food processor – couldn’t you use your immersion blender in a small container? I’ve done that at times – especially if the stuff to puree is not REAL hard. I’ve made a mango cake we liked but the only bread I used mango in used the dried mango and it was good too. Enjoy. What a nice memory — growing up in Hawaii with a mango tree in the yard. I don’t think I even tried a mango until college. I just pulled out my Dorie Greenspan book and am looking at her recipe. It’s very different than the Saveur recipe, and I’ll have to try it. The recipe I posted is for an 8 1/2 by 4 1/2 inch pan and only calls for 1 1/2 cups flour. Dorie’s fits in the same size pan but calls for 2 1/2 cups flour, an extra 1/2 cup sugar (brown), 3 eggs (rather than 2 eggs and a yolk) and almost double the oil. She also enhances the flavor with ginger and lime. Plus she doesn’t make you puree the mango! Thanks for the recommendation. I really need to try Dorie’s. I love mango bread! When I was little, I lived in Hawaii, and we had a mango tree in our front yard! My mom made loaf after loaf, and we ate it happily!!!! 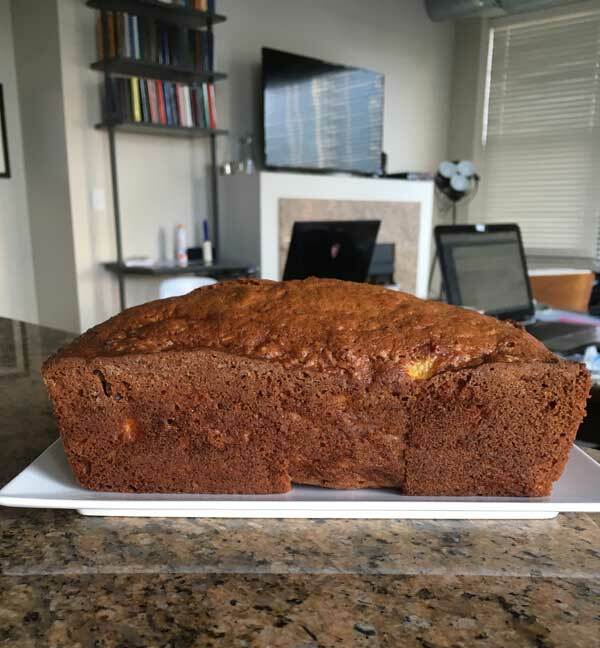 The best recipe I have tried so far for mango bread,is the one by Dorie Greenspan published in her Baking from my home to yours. I can wait to try this recipe!